Some 3,000 homes near Addicks reservoir and 1,000 homes near Barker are inundated due to water release, Harris County Flood Control District meteorologist Jeff Lindner said Wednesday morning. While the water is receding in some parts of Harris County, that's not the case along the Buffalo Bayou. Underneath Interstate 45 in downtown Houston, it resembles a raging river. The bayou is above it's all-time peak of 61.2 feet and has hit 62.7 feet. Friday morning, Houston Mayor Sylvester Turner issued voluntary evacuation orders for west Houston residents who already have water in their homes. Harris County Flood Control District says it will be like that for some time as water from the Addicks reservoir flushes into Buffalo Bayou. Officials estimate the situation could remain like this for up to two weeks as they drain Addicks. The water levels at the Addicks and Barker reservoirs have crested, meaning officials do not expect conditions there to worsen. The Army Corps of Engineers is still discharging water into the surrounding area, Harris County Flood Control District meteorologist Jeff Lindner said in a press conference on Thursday morning. By Thursday evening, officials said Barker was 80 percent full and Addicks was about 100 percent full. Since both levels of the reservoir have peaked, Lindner expects no additional structure flooding. He also said conditions along the Buffalo Bayou are not expected to worsen, but they aren't expected to improve. The bayou held steady overnight, Lindner said. Lindner also addressed rumors regarding the dam at the reservoirs, stressing that there is no damage. He said the dam is operating exactly as designed. The watershed has accumulated 35 inches of rain since Harvey started. The Addicks reservoir continues to release 7,000 CFS while Barker sits at a rate of 6,300. Those discharge rates are expected to continue for the next few days, mostly affecting the Kingwood area. Lindner also elaborated on the mandatory evacuation that was established for residents within the Barker community overnight. Many residents were left confused and concerned if their homes would see more flooding. Officials say the mandatory evacuation was implemented to keep people from returning to their homes. Both reservoir outlet gates are open and releasing storm water into Buffalo Bayou. House flooding is occurring in adjacent neighborhoods, and roadways that run through the reservoirs are underwater. 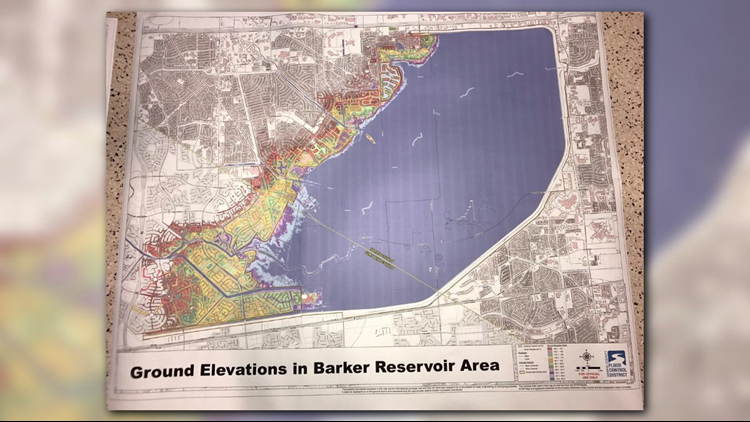 Some 3,000 homes near Addicks reservoir and 1,000 homes near Barker are inundated due to water release, Lindner said Wednesday morning. After an area of the levee eroded on Wednesday morning, officials enforced mandatory evacuations for residents in the Cyprus Creek/Inverness Forest subdivision. Officials said a breach is not likely, but possible. A portion of the levee eroded after water came over the top of the intake system. Several agencies worked on Wednesday to remedy the situation by bringing sand to the area. Addicks reservoir rose quicker than forecasted and threatened the storage capacity, Edmond Rosso with Army Corps Engineer explained. Barker's gates, on the other hand, were opened in a slower manner. While the rain has stopped from Harvey, water levels will continue to rise in neighborhoods near the Addicks and Barker reservoirs as water is released from both, Harris County Flood Control District meteorologist Jeff Lindner told KHOU Tuesday night. “We just don’t know exactly how this is going to play out because its never happened before," Lindner said. Early Tuesday morning Addicks flowed over the spillway. Officials had started to release water from both reservoirs early Monday in an effort to prevent uncontrolled releases at the spillways. However, officials warned that there was potential for uncontrolled releases at the Addicks spillway once the pool level reaches 108 feet. That level is 104 feet for Barker. These releases will continue until Sept. 20. “That’s what happens when you have this amount of rain in this amount of time,” Lindner said. Lindner wanted to emphasize that there was not a breach in the dam on the north end of Addicks, as some people believe. "The integrity of the dams is in fine shape....there is no potential damage to the north end." Residents adjacent to Addicks and Barker reservoirs are being asked to take the following precautions: . This was the first time officials did a release while it was still raining. Officials say they have dam safety experts monitoring the releases around the clock.